CloudTC's Glass 1000 is part of a new trend in SIP and IP based communications. With the use of the Android OS customers now have the ability to use multiple SIP clients. The Glass 1000 combines all of this with an 8.9 touch screen and delivers a usable and feature rich solution for the sales professional or business executive. The information for the Glass 1000 is based on Software version: 2.3.3 Build: 3775, VoIP: 1773.103929. To configure your device please bootup your phone, if you haven't already. Once you are up and running click on the Applications menu item located in the bottom left and select Phone Status. You will be presented with information about the model number, software version, IP and line configuration. You may choose to use the built in configuration tool, which uses the same information as the web based configuration, or can simply use the web based configuration. Here we will use the web based configuration. 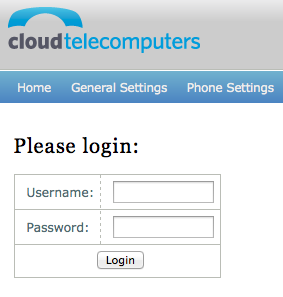 Login to your device using the IP shown and login using admin as the username and admin as the password, unless you have changed this. 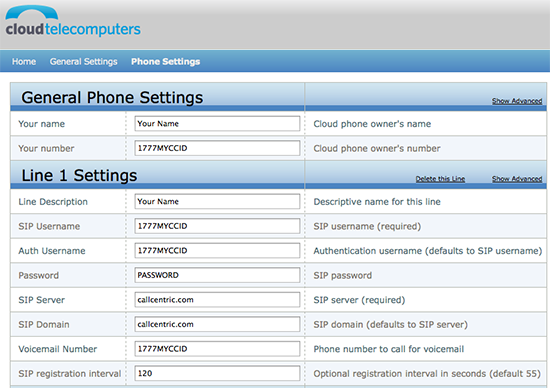 Once logged in click on the Phone Settings link. SIP Username: This is either the default extension 1777MYCCID OR 1777MYCCIDEXT, where 1777MYCCID is the 1777 number assigned to you by Callcentric and EXT is the three digit extension you are trying to register this UA to. Auth Username: This is either the default extension 1777MYCCID OR 1777MYCCIDEXT, where 1777MYCCID is the 1777 number assigned to you by Callcentric and EXT is the three digit extension you are trying to register this UA to.